Mission ‘Exterminate the Waste’ was on full display last week as local service club Voltar’s World and its corporate sponsor Bahamas Waste tackled yet another community clean-up in New Providence. 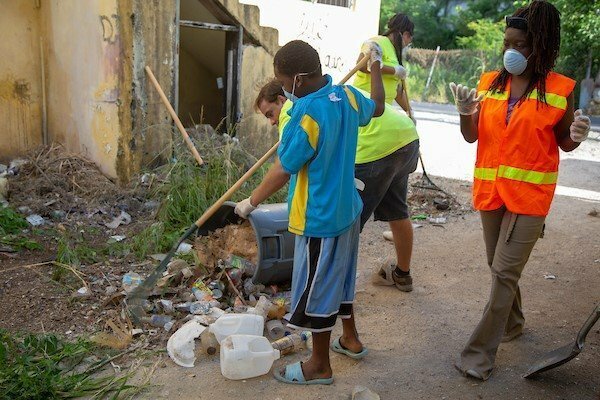 As part of its commitment to community partnership and development, Bahamas Waste, continued to support this young group of hard working volunteers who want to clean up the inner-city communities on their island. “For us, waste management is more than just a business” explained Operations Manager Ethelyn Davis. “We understand that cleaner communities are healthier communities and healthy communities are happy ones, its really about improving the quality of life for residents in these areas”. them execute a series of community cleanups around the island to further their agenda of long lasting change. Thanks to Bahamas Waste, Lewis Street was provided with several 20ft dumpsters which were filled to capacity and later properly disposed of. “Once we have finished our work on Lewis Street, we are looking forward to another partnered event on September 22 nd ” geared at getting people up and moving in their communities” said Lowe.